Core aeration and overseeding services are one of the best products you could invest in for your Utah lawn. It’s low cost and gives your lawn the much-needed care to survive and thrive in Utah’s arid climate. Since Salt Lake City, Park City and Heber-Midway are in the mountains, the soil is more desert/clay soil. Utah soils are very hard, and soil compaction is a reality for all Utah lawns. We recommend aeration two times a year—one time in the spring and another time in the fall. For our aeration services, we use an aerator to pull small plugs of soil out of the ground. Aeration opens up the soil to receive water, sunlight and oxygen. It also allows carbon dioxide to release from the soil as well as helps with thatch reduction and encourages deep root growth. The soil plugs dissolve back into the ground the next time it rains or you water your lawn. We also have an organic aeration product that works the same way as traditional aeration—but without the aerator and the soil plugs. It’s an organic liquid aeration that helps feed the soil as well as loosening it up. As homeowners living in Salt Lake City, Park City, and Heber-Midway, UT, you desire a beautiful, dense lawn that leaves no room for weeds. Plus, you want to avoid brown spots and turfgrass death occurring during the dry, hot summers. Aeration and overseeding services help prevent these lawn problems from developing. When you invest in our organic and hybrid lawn care services, you’re going to reduce the number of harmful chemicals used on your UT lawn. Instead, you’re going to have a vibrant eco-system that starts in the soil and goes upward toward your lawn grass. At Ecolawn Care, we hire only the best. Our technicians are degreed and certified to perform lawn services in UT. You can feel confident that your Ecolawn technicians will do an excellent job on your Park City lawn. When you hire us, you’ll notice that we’re not a “spray and go” lawn care company. We strive for quality in every part of our business including aeration and overseeding services. How Does Aeration and Overseeding Work? Aeration and overseeding services open up the soil to breathe as well as receive nutrients and seed. Your lawn will stand up better to harsh Utah summers when it receives the care it needs. Liquid aeration conserves water as well as it retains moisture deep in the soil. Roots grow downward and expand leaving your lawn with a deep root system. Liquid aeration also undoes the damage that the desert climate and hard soil cause Park City lawns. At Ecolawn, we’re working on either your lawn grass or the soil that houses it. Your lawn’s root system will be robust because it’ll grow deep down into the ground with aeration and overseeding. Aeration also allows seeds to be planted deeper into the soil resulting in seedlings developing deeper root systems at the same time as growing a dense and green turf aboveground. Your UT lawn will thin out, allowing weeds to take over your Heber-Midway property. Your lawn won’t recover well from drought and heat stress over the summer leaving brown spots and weeds to germinate. You end up wasting money because aeration services cost less than having to renovate a damaged lawn. Aeration is one of the best services you can invest in because you’re making your turfgrass stronger to handle summer’s harsh weather. You can expect healthier and deeper root systems, fewer weeds, disease and brown spots. Your lawn will be able to recover in the fall back to its original green color and thickness. Aeration again in the fall encourages deep root growth, so your lawn survives the winter and thrives the following spring. How Long Does It Take to Notice a Difference in Your Salt Lake City Lawn? It takes half a season to a season to see the results of your investment. Since aeration services are a low-cost item, it’s an excellent investment for protecting your lawn from the harsh Utah summers. We have turfgrass science to back us up. 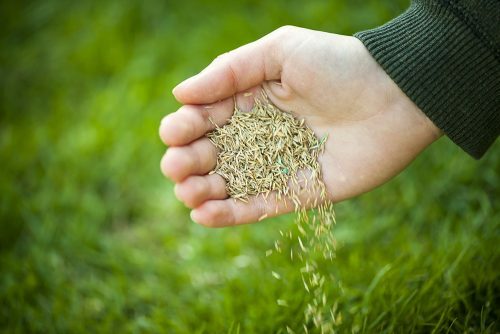 Utah State University, a land grant university, has articles discussing the benefits of aeration and overseeding services for local lawns. At Ecolawn, we care about quality. We develop a holistic approach to lawn care that includes feeding and nurturing the soil as well as encouraging healthy lawn grass. We care about our customers’ peace of mind and satisfaction with all of our organic products and services. We value customer support and communication. If a product isn’t working or you have questions about your recent application, call, email or text us with your questions. We’ll get back to you with an answer. Ecolawn’s quest is to find and use the best organic options on the market as well as deliver exemplary customer service. We use a variety of equipment. For aeration and overseeding, we use an aerator and then, a slit seeder to overseed your Salt Lake City lawn. For liquid aeration, we’ll apply an organic liquid spray made with all natural ingredients using a backpack applicator or a larger tank with a hose. We’ll flag the area where we applied our liquid aerator, so no one walks or plays in the treated area. Even though our organic lawn products are safe, we do recommend that you wait a few hours before sending your children and pets out to play in the yard. When you become one of Ecolawn’s customers, we take copious notes of your property. We get to know your lawn so well that we know which areas need more attention compared to other parts of your property. For example, we’ll know if one part of your lawn is more heavily compacted than another space. So, we’ll make extra passes with our aerator to loosen up that heavier soil. We customize our lawn care services, including our core aeration and overseeding services, to benefit your unique lawn. We don’t employ a one-size fit all approach to lawn care. If you choose one of our competitors, you may not get the same level of customization and one-on-one customer service as you would when you partner with us at Ecolawn Care.